Down a hill, nestled next to the Austin greenbelt sits a two-story house in the Lost Creek neighborhood. Built in 1989, the homeowners felt that it was time to update and remodel their kitchen, to better fit their needs for cooking and entertaining and to reflect their elegant traditional style. with rearranged appliances for a more logical work flow and a healthy amount of breathing room. This reorganization opened up room for a new coffee bar and fold out pantry, as well as an expansive granite island with a built-in prep sink. Now the kitchen is open and modern enough for entertaining, but traditional enough to satisfy these homeowners’ personal style. 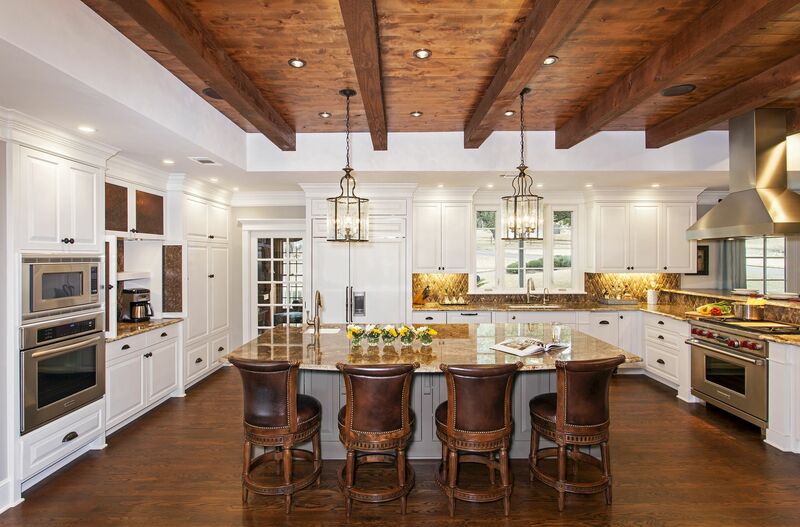 The new kitchen focuses on an elegant traditional aesthetic, with a dramatic wood-beamed ceiling and rustic touches throughout. Modern fixtures and finishes keep the space from feeling dated and lend the kitchen contemporary functionality. While the new layout and updated appliances were enough to satisfy the homeowners, the elegant finishes and hidden details are what set this kitchen apart. Due to changes being made to their garage, the old utility space had room to expand. The space was reconfigured and transformed into an area that can be used with ease. The original kitchen had an awkward layout with outdated finishes. In the middle of the space was a skinny, tile-top island and prep sink. The wash sink was located in the corner of the kitchen and the two-level, tile-topped bar had a peninsula island that jetted out and enclosed the space. Additionally, the cabinets hung on the walls and did not go all the way up to the ceiling and the kitchen was lacking storage space and prep areas. and efficient utility space, this Austin family can enjoy their transformed home with comfort and ease.